Is this the future of blockbuster movies? Films made with more concern for the international box office than the domestic one, where the universal language is the clash of pixels? It’s no secret that, based exclusively on its U.S. receipts, Guillermo del Toro’s 2013 Pacific Rim didn’t earn the right to have a follow-up. But the movie was big in China and that led to Legendary Pictures (which was purchased by a Chinese corporation) and Universal Pictures coughing up the money to make Pacific Rim Uprising. Like most unintended second installments, this one is superfluous – a remix of moments, scenes, and images from its predecessor infused with the need to make everything bigger and louder. Even more so than Pacific Rim, Uprising is a throwback to the Japanese monster movies of the 1970s. The cutting-edge computer-generated special effects make things higher priced but not necessarily better. Fortunately, director Steven S. DeKnight (making his feature debut after previously writing/directing/producing episodes for TV series like Daredevil and Angel) doesn’t go “full Transformers” – a degree of restraint that at least makes the sequel watchable, if not “good” by any reasonable definition of the word. The core problem is the same one may soulless, effects-oriented films encounter: the more we’re exposed to fight scenes like the ones Pacific Rim Uprising presents, the more monotonous they become. There’s not a lot of variety here – it’s just giant robot-on-giant robot or giant robot-on-hideous alien. In Pacific Rim, del Toro showed not only an affection for the genre in which he was working but the ability to transform stereotyped characters into living, breathing human beings. Idris Elba, Charlie Hunnam, and Rinko Kinkuchi weren’t just actors thrown into the movie to give it a live-action component; they were the heart and soul of the story, and that’s one reason why Pacific Rim worked. Its absence is why Uprising often doesn’t. Speaking of the original’s main trio, Elba’s character remains dead, Kinkuchi has a small part that is disappointing in all aspects, and Hunnam’s Raleigh Becket isn’t mentioned. Raleigh’s absence is notable, although apparently he was in the original screenplay but, when Hunnam wasn’t available (due to a conflict), a rewrite changed Raleigh into the new character of Nate Lambert (played by Scott Eastwood). Uprising opens ten years after the Battle of the Breach. Although the world hasn’t been bothered by a Kaiju since Stacker Pentecost gave his life to help seal the Breach, the Jaegers continue to stand at ready. New recruits are trained under the tutelage of the old Rangers and rogue Jaegers are routinely captured and/or disabled. Jake (son of Stacker) Pentecost (John Boyega), who has been making his living as a thief and scrap merchant, is brought back into the fold after being arrested stealing a disabled Jaeger’s power core. Along with him comes the perky Amara Namani (Cailee Spaeny), who painstakingly created her own mini-Jaeger. The film’s first half contains a fair amount of dense exposition to go along with halfhearted attempts to humanize some of the cardboard characters. The only one who emerges with a hint of three-dimensionality is Jake and that’s more because of John Boyega’s likable performance than anything in the screenplay. Boyega invests his protagonist with the same quirky insouciance that he brings to Finn in the new Star Wars trilogy, although Uprising allows him to slide into the Han Solo-inspired role of rogue-turned-hero rather than being sidelined as was the case in The Last Jedi. And, although his sidekick in this film, plucky Cailee Spaeny, doesn’t exemplify great character-building (she’s the classic tough girl who finds purpose in the struggle against evildoers), she and Boyega share a better chemistry than Boyega and Kelly Marie Tran in Jedi. Scott Eastwood is more notable for his startling resemblance to his father (Clint Eastwood) than for anything he does acting-wise. Two other holdovers from Pacific Rim are the “dueling doctors” of Hermann Gottieb (Burn Gorman) and Newton Geiszler (Charlie Day). Newton is given a larger and more interesting role than the one he had in the previous film; unfortunately, the range demanded for the part exceeds Day’s capabilities. Once the narrative wades through the undertow, Uprising gets to the things most movie-goers have come to see: the fight scenes. Although competently crafted, they’re overlong (especially the climactic bit of silliness, which takes place on Mt. Fuji in what I assume is an homage to all those Japanese monster movies) and not terribly exciting. The incorporation of humans into the fights (by putting them inside the Jaegers) provides a level of investment that’s absent from the Transformers movies but this device would have worked better (as it did in Pacific Rim) if the characters had been more than interchangeable background pieces. We care about Jake and perhaps Amara but not really anyone else. Viewers with low but reasonable expectations will probably be satisfied with what Pacific Rim Uprising offers. It doesn’t pretend to be anything other than what it is – a second chapter made primarily for an overseas audience that hasn’t yet tired of the wonders that excessive CGI can bring to the big screen. 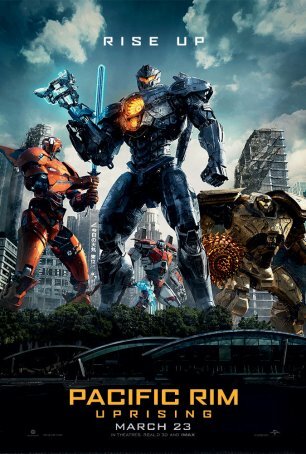 Like nearly all unnecessary sequels, it’s the wedding of “bigger is better” with “more of the same.” Unfortunately, all the little subtleties that made Pacific Rim charming are lost in the new film’s mayhem. This is B-movie material with an A-movie budget. There’s an audience out there for stuff like this but I don’t think it’s as large as the filmmakers hoped when they scoped out the possibilities for additional installments. It’s hard to see much of an upside for Uprising.